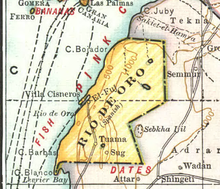 On August 14th, 1979 Morocco recovered the southern province of Oued Eddahab (formerly Western Sahara territory of Rio de Oro) from Spanish occupation. On that day, at the Riad palace in Rabat, a 360 person-strong delegation, was dispatched by the population of the region to renew before King Hassan II the oath of allegiance and their attachment to the Alaouite throne. The sovereign then delivered a historic speech in which he vowed to guarantee their defense and security and endeavor for their well-being. is one of the 16th regions of Morocco. It is the most southerly region bordering Mauretania to the south and east. The capital is the coastal city of Dakhla, formerly known as Villa Cisneros. Its name seems to come from an east-west river which was supposed to have run through it formerly. The river was thought to have largely dried out - a wadi, as the name indicates - or have disappeared underground. 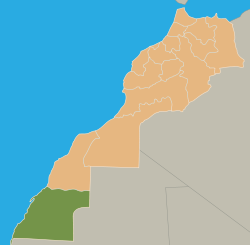 Saguia el-Hamra (Spanish: Saguia el Hamra, Arabic: al-Saqiyah al-Hamra'a; literally in Arabic, "Red Canal"), is, with Río de Oro, one of the two territories that formed the Spanish province of Spanish Sahara after 1969. Its name comes from a waterway that goes through the capital.